Starting our 2015/2016 Season off with a Bang at the Connecticut Auto Show! We were back in Hartford at the Connecticut Convention Center, November 20-22 for the Connecticut Auto Show – and what a show it was! The 2nd year in a row without any run ins with Mother Nature and a soar in attendance – we’ll take it! Strangely enough, our Lobby was probably the hottest spot of the show this year as we provided an impressive display of exotic vehicles including the Rolls Royce Ghost, Bentley GT, Lamborghini Huracan and not one but TWO rare Ferraris – the 2014 LaFerrari (1 of only 499 produced) and the 1995 Ferrari F50 (1 of only 349 produced)! 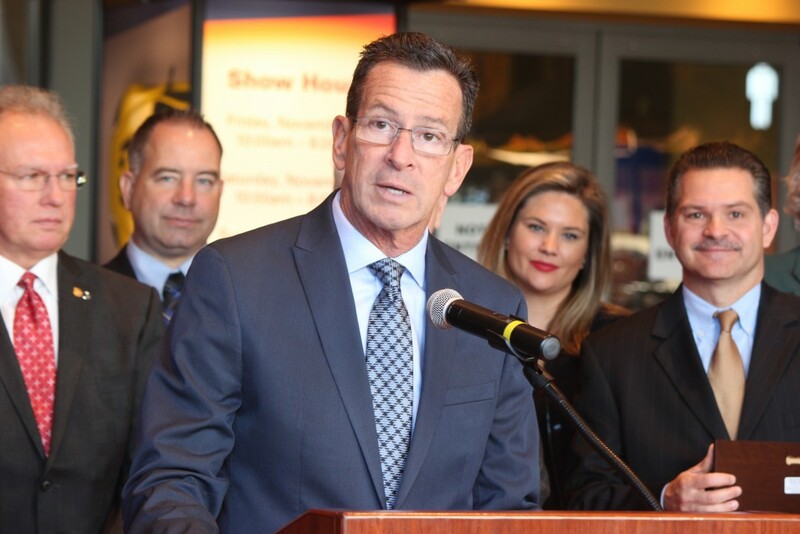 Governor Dannel Malloy was back to kick off the Show, chat about the Connecticut Hydrogen and Electric Automobile Purchase Rebate Program, and most importantly, cut that ribbon with those giant scissors! In addition to the excitement in the lobby, we had one of our most jam packed show floors in years, complete with the latest and greatest models from over 25 car lines and vehicle highlights including the 2015 Alfa Romeo, Porsche 911, the all new 2016 Scion iM and iA, 2017 Audi Q7, 2017 Ford Super Duty and several highlights from the electric vehicle world including the BMW i3, 2016 Hyundai Sonata Plug-In, the Toyota Mirai FCV and the 2016 Chevy Volt. Friday night was ‘Ladies Night’ as the Connecticut Cadillac Dealers sponsored ‘Heels & Wheels Night’ in their display where the ladies could nosh on delicious snacks and drinks, create their own custom chocolate bar and take home some Cadillac swag with them! And a donation of a new or gently worn pair of shoes got you a complimentary Pink Cadillac Martini. So if the rest of our shows go anywhere as wonderfully as the 2015 Connecticut Auto Show, we’re in for a great season! Next up – a jam packed Martin Luther King Day Weekend in Boston with the New England Auto Show, January 14-18 and the Boston RV & Camping Expo, January 16-18, both happening at the Boston Convention & Exhibition Center!